The plot: Foolish love and heartbreak has followed the descendants of the Roux family for four generations. This novel shares the tale of Ava Lavender, born with wings, as well as the intricate, strange, and forlorn tales of her mother and grandmother. 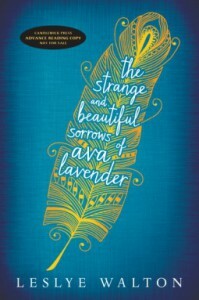 As her desire to learn more about herself and her unique condition grows, Ava explores the stories of her family history and the other in her little town, all leading up to a cataclysmic event that will change the lives of the Lavender family. The characters: This novel is filled with rich, unique and deeply interesting characters. Readers will enjoy the narrative, as if they are sitting with the characters and listening to stories passed down through generations. Ava is a dynamic heroine. I enjoyed the fact that the novel includes many strong female protagonists. The 'villains' are also deliciously strange and artfully written. Overall evaluation: Walton's debut is certainly a standout of 2014 in YA fiction. The elevated characters, style, and writing make for an intriguing read that will appeal to readers looking for something just a little different from other popular genres. I was surprised by how much I enjoyed the story, its message, and the development of the writing. One word of caution, this is probably best for older readers, grades 9-12. The writing and situations has moments that are more sexually forward that other YA books.